Timing Belt Water Pump Kit Fits 94-04 Toyota Lexus 3.0L V6 DOHC 24V 1MZFE. THIS KIT INCLUDES: 1 WATER PUMP & GASKET 1 TIMING BELT 1 TIMING IDLER BEARING 1 TIMING TENSIONER BEARING 1 TIMING HYDRAULIC TENSIONER ADJUSTER 3 TIMING SEALS. Car Parts Wiz will not be responsible for any labor, towing, fluids, Freon, filters, lodging, and car or truck rental. These varies are based on Weight, Dimensions, and Destination. CARPARTSWIZ is a complete provider of quality replacement aftermarket automotive parts. We appreciate your patience and thank you for your business. This listing is currently undergoing maintenance, we apologise for any inconvenience caused. 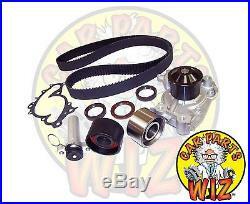 The item "Timing Belt Water Pump Kit Fits 94-04 Toyota Lexus 3.0L V6 DOHC 24V 1MZFE" is in sale since Monday, April 29, 2013. This item is in the category "eBay Motors\Parts & Accessories\Car & Truck Parts\Cooling System\Water Pumps". The seller is "carpartswiz" and is located in Los Angeles, California. This item can be shipped worldwide.